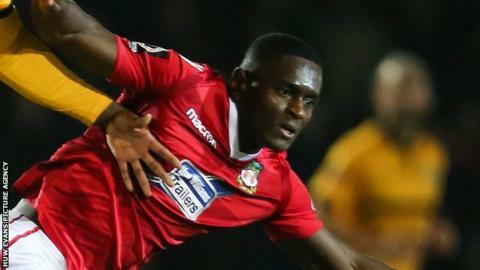 Promotion hopefuls Wrexham remained top of the National League with victory over Chesterfield. Midfielder Akil Wright broke the deadlock just after the hour mark, nodding home a quality cross from Luke Young for his third goal of the season. Bryan Hughes' side are two points clear of second-placed Solihull Moors but have played one game more than their nearest rivals. Chesterfield slip closer to the drop zone and are now 19th. "It wasn't the most entertaining performance, but we did what we had to do. "Results are going well for us and the players take a lot of credit for that. "We've got a squad that are ready and hungry to play for the shirt and the players are giving everything. "We were workmanlike today, it was very tight and the game could have gone either way." Match ends, Wrexham 1, Chesterfield 0. Second Half ends, Wrexham 1, Chesterfield 0. Substitution, Chesterfield. Kyel Reid replaces Ellis Chapman. Substitution, Chesterfield. Lee Shaw replaces Robbie Weir. Substitution, Wrexham. Jason Oswell replaces Stuart Beavon. Shwan Jalal (Chesterfield) is shown the yellow card. Goal! Wrexham 1, Chesterfield 0. Akil Wright (Wrexham). Second Half begins Wrexham 0, Chesterfield 0. First Half ends, Wrexham 0, Chesterfield 0.